This depiction of his friend and collaborator is part of a series recording the artists of Alfred Stieglitz's circle. Stylistically more mysterious and suggestive than his commercial caricatures, this drawing suggests de Zayas's Symbolist inspirations as he adapts his style to depict his artistic colleagues. Stieglitz is shown as a solitary figure, emerging from a dark background. Recognizable by his bristly moustache and glasses, de Zayas subtly differentiates between Stieglitz's black outfit and the black field, to create a spectral vision. The elongated figure furthers this immaterial representation of the body. The darkness is punctuated only by a glowing full moon that circles Stieglitz's head like a halo and suggests a quasi-religious role for the gallerist. The drawing evokes an otherworldly spirit. This caricature was most likely part of de Zayas's first exhibition at 291 gallery, iin January 1909. It marks his arrival as part of the Stieglitz group, as the exhibition signaled his ascension from a commercial illustrator to a fine artist. The work was reproduced in Stieglitz's Camera Work in 1912, where it was subtitled as "The Midwife to Ideas." - making clear Stieglitz's role as a facilitator for modern art in New York. The politically progressive de Zayas family was forced into exile when Marius was a young man. 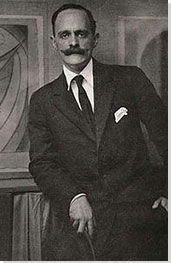 In New York, de Zayas drew political cartoons for a variety of newspapers and magazines, often criticizing America's actions towards Mexico and other less powerful countries. He was particularly distrustful of Theodore Roosevelt and William H. Taft, believing they only represented the interests of American industrialists such as John D. Rockefeller and his Standard Oil Co. In this cartoon from the Evening World Daily Magazine, both men, along with the Republican elephant, are immersed in dark waters - or crude oil - labeled "corporation campaign corruption." In his April-May 1913 exhibition at Alfred Stieglitz's "291" gallery, de Zayas showed a series of caricatures; some were in his conventional style that played with a recognizable and popular subject, but others, such as this portrait of Stieglitz, represented a new level of abstraction. This depiction of Stieglitz aims to express his complicated personality, along with his intelligence and spirit, through the use of complex mathematical equations. There are some physical traces of Stieglitz, most notably his bristly mustache (represented by a series of parallel lines in a triangular form on the lower left) and his glasses, which are repeated in a vertical series of circles to suggest the intensity of his focus and artistic vision. These circular elements, however, were also abstractions based on an object - a "soul catcher" - that de Zayas had seen in an ethnographic museum. Bringing together the abstract and the representational, de Zayas creates a portrait that suggests both the physicality and the spirituality of his subject. De Zayas's abstract caricatures directly inspired the machine portraits of Francis Picabia, which became an important part of Dada in America. Replacing the portrait subject with an assemblage of objects and formal components of line and color became a new genre of painting among the New York avant-garde. Other modernists would adopt this technique to portray friends and lovers without resorting to traditional representation. Indeed, these object portraits created coded meanings that were comprehensible only to a small circle of associates, tracing a network of experimental artists in the 1910s and 1920s. The first example of American visual poetry, de Zayas produced this work in collaboration with Agnes Ernst Meyer; it was published in 291 journal in April 1915. He was directly inspired by the experimental poetry, known as caligrams, of his French colleague, Guillaume Apollinaire, whom he had befriended in Paris and exchanged a number of works. In a letter to Stieglitz, de Zayas enthusiastically explained that Apollinaire was "doing in poetry what Picasso is doing in painting. He uses actual forms made up with letters. All these show a tendency towards the fusion of the so-called arts." Printed as a double-spread in 291, a journal named in honor of Stieglitz's gallery, but published by de Zayas, Meyer, and Paul Haviland, the poem combines a text by Meyer and an abstract black-and-white drawing by de Zayas. A vaguely human form can be picked out from the series of black triangles, prominently labeled with "FLIRT." Indeed, the mental reactions of the title refer to a series of non-sequitur reflections from a woman torn between frivolous romances and the obligations of her life. The text is printed in a series of blocks that do not have an explicit order, leaving the reader to wander across the field and compile a random experience from many possible arrangements. De Zayas corresponded with the Dadaists in Europe, and sent them copies of 291 that influenced their experimental poetry, he remained independent from their movement.